Borrelli writes that the University of Illinois at Chicago (UIC) Electronic Visualization Laboratory (EVL) “has a small but curious cameo in the first ‘Star Wars’ movie - the Death Star battle plans that are presented were created there, by a small group of programmers and animators in 1976” (for the film’s release in 1977). At that time, traditional special effects were primarily done using optical (photographic) and mechanical (physical) techniques; computer generated imagery was in its infancy. The “Star Wars” movie’s special effects were done traditionally, except for one brief scene - a computer model of the Death Star that is viewed by the Rebel Alliance in their briefing room as they try to determine the best way to destroy it. California artist Larry Cuba wanted to bid on the computer graphics, but commercial software was either non-existent or proprietary, and hardware was expensive. So, Cuba approached Tom DeFanti, a computer graphics pioneer, computer science professor and co-founder of EVL, and asked to use lab’s hardware and software to create the film’s content. Though the scene took months to generate, its legacy has lasted decades. “Star Wars” came out years before Lucas created Industrial Light & Magic, and years before he created its precursor, the Lucasfilm Computer Graphics Research Group, which ultimately became Pixar. Steve Heminover, who worked at EVL as a UIC undergraduate when Larry Cuba was there, was able to keep the computer graphics hardware, software and associated data files from the scrap heap as the equipment aged - and, more serendipitously, was able to restore and make it operational. This article contains a video clip by Tribune photographer Chris Sweda, in which Heminover demonstrates the working computer system. 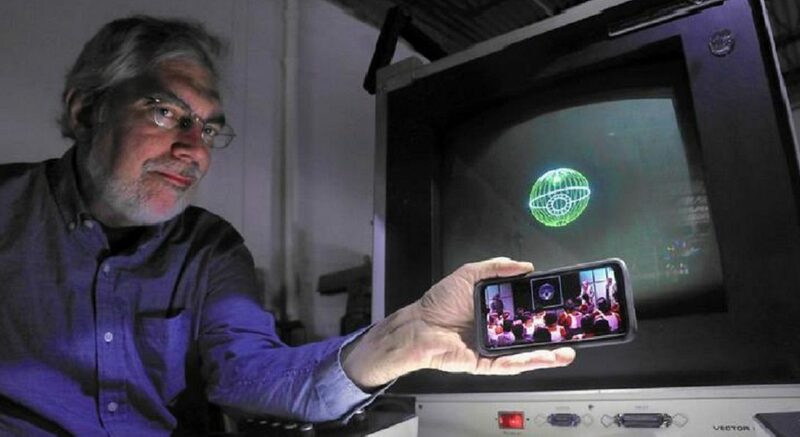 And, as the Death Star’s blueprints rotate on the old vector display, Heminover plays the briefing room scene from the original movie on his smartphone in the foreground.